← those random photo shoots. healthy bits from last week. Happy Sunday friends! I hope you’ve had a nice weekend. It is sunny and 54 here right now! It’s windy, but it’s such a nice day out. Tomorrow the low is 14 and they’re calling for scattered snow showers. You just never know what the weather will be like in East Tennessee. Our Maryland friends got some snow last week! Lately I have really been missing Maryland, and mostly our friends there. I think because our first winter there was so intense [3 blizzards], winter just makes me think of Maryland. And my heart misses our dear friends there. I loved our little house in the snow. It was cozy and the radiant heat made it feel even cozier. None of that has anything to do with my post today though. Today I wanted to share what #healthyandorganized2014 steps I took last week. Like I mentioned a couple of weeks ago, I haven’t been as good on the healthy as I have on the organized. 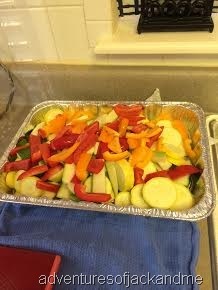 I did make one of my favorite, very healthy vegetables dishes a couple of weeks ago. Last week Tommy’s mom, his uncle from Wisconsin, and Tommy’s mom’s friend, Christy, came over for lunch. Christy brought this for dessert. It was very sweet, very delicious and definitely a healthy dessert option. 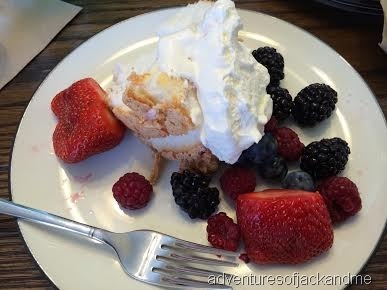 Angel food cake is a great way to go to save on calories and the berries are a great way to get in fresh fruit. Top it off with low fat cool whip and you are in healthy dessert business. 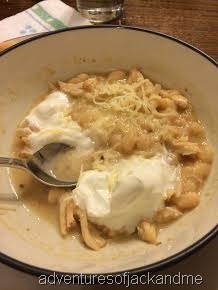 As I shared earlier in the week, I made white chicken chili. It was such a healthy dinner and so easy to make.